Liverpool’s major summer spending spree is set to claim its first casualty as winger Lazar Markovic is reportedly keen on a return to former club Benfica. The Serbian international joined the Merseyside club last summer in a deal thought to be in the region of £20 million [via BBC Sport], however, he has not been able to nail down a regular place in the starting line-up under manager Brendan Rodgers. Despite making 20 appearances in the league last season, Markovic was often used as a wing-back and very rarely completed the full ninety minutes on the occasions that he did start. The 21-year-old scored twice for the Reds last season, but it appears the considerable additions to the Reds’ squad this summer has caused him to consider his future. Reports in Italy [via Express Sport] claim Markovic is open to rejoining Benfica after seeing Liverpool agree deals for James Milner and Roberto Firmino. 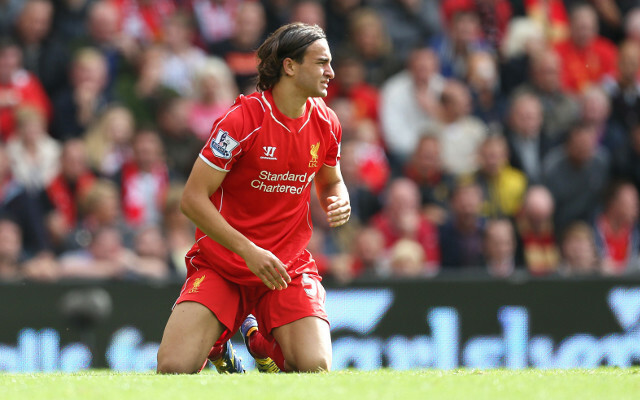 With the latter pair versatile enough to cover the wide berths, it immediately limits first-team opportunities for Markovic next season and he appears to be keen on cutting his time on Merseyside short. The emergence of Jordon Ibe, who impressed when featuring as a wing-back or in a more advanced role, may also spell trouble for the Serbian international.